meeting of the parties to the conflict, Morocco and the POLISARIO Front, and of Algeria and Mauritania. Conflict specialists the International Crisis Group have identified this as a sign of a ‘resolution opportunity’ for the conflict. Talks continued in March this year. instability to the territory. Above all, the continued denial of the Saharawi people’s right to self-determination creates tension, frustration and “an illegal situation”, in the words of the EU Advocate General. The UN needs to take action to build confidence among the people of the region, especially the Saharawis, that law and human rights will be respected in the future of Western Sahara. Without that confidence, renewed conflict remains a danger; with it, a peaceful solution becomes a possibility. Help us to drive forward the achievements of the last year. Please write to or email the Minister of State for the Foreign and Commonwealth Office and the UN Security Council. Please use some of the notes below but write in your own words as this will have more impact. Don't feel you have to use all the points as we would like each letter to feel individual and raise different points. The UN Security Council: write to or email the German Ambassador (Germany currently holds the Presidency), asking that he circulate to all members of the Security Council or write to all members of the Security Council if you feel able (use this list of UN contacts). • Give strong support to UN Envoy Horst Köhler’s efforts to break the deadlock. • Grant MINURSO the legal mandate to monitor and report on human rights in territories controlled by the Kingdom of Morocco and the Frente POLISARIO. This body must report its findings directly to the UN Security Council. currently languishing in Moroccan jails. • Demand an end to the extraction of natural resources from Western Sahara through deals which disregard the interests and wishes of the indigenous Saharawi. 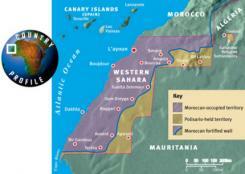 • Consider how MINURSO could support the upholding of international law with regard to the illegal exploitation of Western Sahara’s resources by Morocco. option for independence on the ballot paper, as required by international law. You can read the 2019 MINURSO Briefing for further information and background to these points.